Q: What’s better: illustrating or having illustrated? A: I think both are very important. I love the process of painting, creating, trying new things. Having illustrated is also very critical, because looking back at your old work and learning from it is one of the most valuable parts of art. I wish to continue drawing and painting all my life, expanding my repertoire and learning new techniques. A wonderful part of the illustration portion of creating is that I can translate my emotions onto paper, express my feelings and ideas. Once something is drawn, I look back at it from time to time to see how much I have grown, both as a person as an artist and remember the emotions I felt while drawing. Drawings get old really fast for me, as something I drew yesterday I can already draw better today. Moving on and just constantly practicing is what I enjoy most about art. So I guess my answer is both. Kathryn Hammond‘s image “Fire” is the cover art for our October 2017 stories. Kathryn is a potato who lives in Virginia with her superhero dad and yoga teacher mom and her dog, Rusya. Her sister is also an artist, and together they have journeyed through the ups and downs of discovering their true selves within their work. She is hoping to study environmental science in the future and save the world. 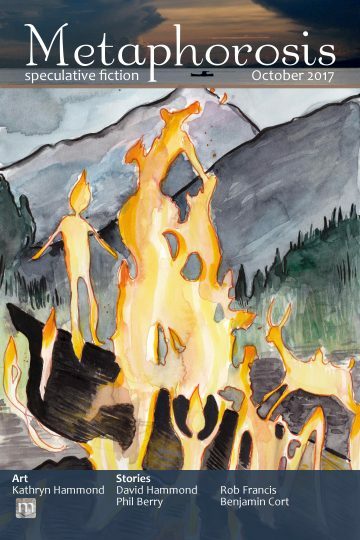 katyaham.deviantart.com Kathryn Hammond‘s image “Fire” is the cover art for our October 2017 stories.